Kniesel’s staff demonstrating how to check under the hood. Mercy Multiplied’s residential program is uniquely designed to address the whole person – body, mind and spirit. It features biblically based counseling and teaching integrated with life-skills training and educational opportunities. Specific life-skills, like finance management and resume writing, are taught in practical ways to teach the residents responsibility and help them learn skills they may not otherwise know. Recently, Kniesel’s Auto Service Center, based in the Sacramento, California area, went above and beyond to teach a Car Care Life-Skills class to Mercy’s Sacramento residents. Mark Brocke, Community Relations Manager at Kniesel’s, heard about Mercy through a networking event and was happy to volunteer their resources. “Knowledge is power. 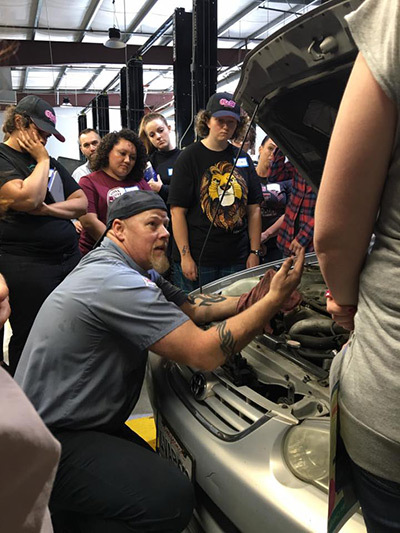 Being aware of the need for preventative maintenance, being able to check tire pressure and identify, and inspect fluid levels – these life-skills are empowering!” Brocke said. The residents learned valuable car care skills, such as preventative care maintenance, what to do in a roadside emergency, and how to install a car seat. They also learned how to check fluids under the hood and how to check their breaks and suspension. The Kniesel’s staff even gave them tips on how to find a good auto shop. The residents not only learned valuable car care skills, but they were blessed with a continental breakfast. 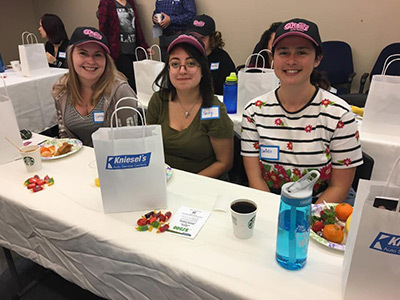 Kniesel’s staff also gave them goodie bags, which included a t-shirt, baseball cap, small tools, a tire pressure gauge, and their personal business card to answer any questions. The staff continued the red-carpet treatment and gave raffle prizes as well. Mercy residents enjoyed their breakfast. The residents were thankful to Brocke and the entire Kniesel’s Auto Service Center for their time and expertise. To learn more about Mercy’s life-training skills, click here. For information on how you or your business can partner with Mercy Multiplied, click here.